The heavy exploitation of many of the world’s fish stocks often demonstrates continued depletions of standing stock biomasses with increasing fishing effort. This can occur both locally and further afield depending on the local fisheries productivity and if it is sufficient to sustain consistent earnings for local fishers. Although a significant amount of research has been undertaken to define the ecological consequences of overfishing and redirected fishing effort, our understanding of the social mechanisms of such effects remains poor. 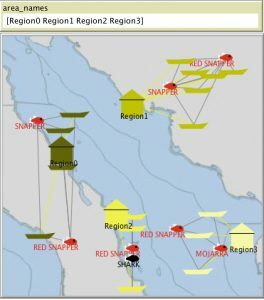 To address this gap we build an Agent-Based Model designed with empirical observations and quantitative data of fishing effort, landed species and historical landings of small-scale fisheries (SSFs) in the Gulf of California, Mexico. The model takes into account different social mechanisms for fishers’ behavior related to their movement between fishing grounds. We investigate which social and ecological conditions likely cause or prevent sequential resource depletion through increased fisher mobility and spatial changes in fishing effort, in a dynamic setting. The successful management of natural resources will come from the sound integration and understanding of ecology, economy and social wellbeing on a case-by-case basis. The work we present herein is a first step in understanding the mechanisms determining the movement of SSFs following scenarios of overfishing and stock collapse. This knowledge will have important implications for the management of SSFs, particularly those with heavily exploited stocks, productive neighboring areas and objectives of rebuilding and sustainable exploitation. MAREA Project page: NSF funded coupled-human nature project 2016-2018. The overarching goal of MAREA is to generate and share knowledge of the coupled social-ecological systems associated with small-scale fisheries, and to translate that knowledge into actions that contribute to more resilient, equitable societies and healthy coastal marine ecosystems. SES-LINK team members are responsible for the ABM part.